BELIZE CITY, Mon. 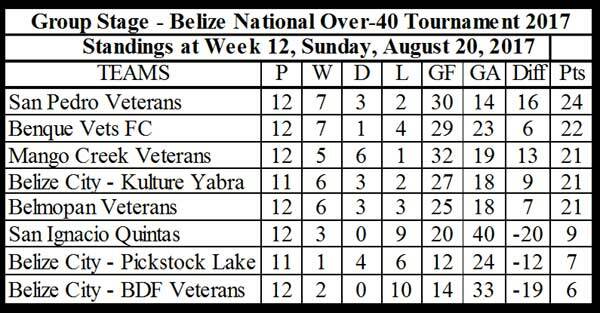 Aug. 21, 2017–San Pedro Veterans are sole leaders at Week 12 of National Over-40 football, after their 2-1 win over Kulture Yabra Veterans yesterday at the MCC. Kulture took the early lead on a strike by leading goleador, Kevin Rowland that saw the ball rebound off the goal post after beating San Pedro goalie Aldon “AC” Augustine, and bounce out after crossing the line; but before the half ended, San Pedro returned the favor, as Jacinto Pinelo’s free kick from 35 yards out eluded Kenny Morgan in goal for Yabra and crossed the line before bouncing back out. 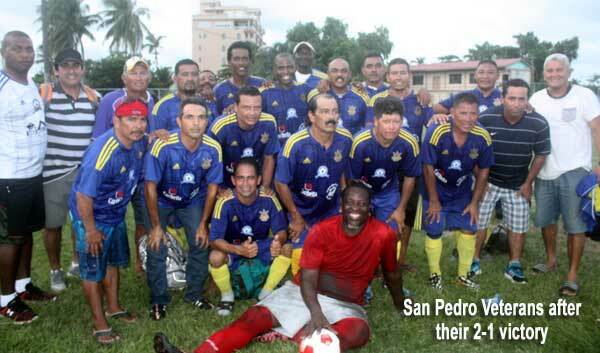 Early in second half, San Pedro got the 2-1 game winner from Christopher Hendricks, who trailed a long center from the left side to slap in the volley past Kulture’s Maurice “Magic” Francis, who had replaced Kenny Morgan in goal to start second half. 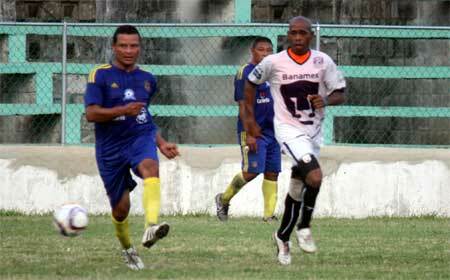 In other National Over-40 action on Sunday, Benque Vets FC clobbered the visiting Pickstock Lake-I Veterans, 6-1, at the Amin Hegar Field; Mango Creek Veterans bombed the visiting San Ignacio Quintas, 8-2; and Belmopan Veterans stopped BDF Veterans, 2-0, at the Isidoro Beaton Stadium.